51549-SS is rated 3.0 out of 5 by 2. 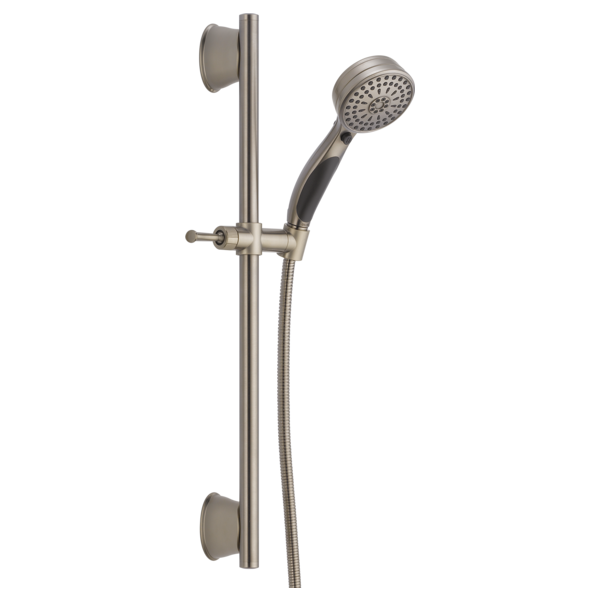 Rated 2 out of 5 by terri from not right for us I was hoping to find a shower head was "fully" adjustable. I wanted to be able to easily swivel it in addition to being able to slide it up and down. When it was delivered, I realized it didn't fit the bill because the head doesn't swivel. So, I returned it right away without installing it. It looked decently made though. How DO Your Adjust the ANGLE of the Handheld Spray Head when in the Sliding Mount ?? In a Previous Answer You indicated it is adjustable up to 15 degrees. HOW ??? Not shown in Instruction manual. HELP PLEASE !!! I just installed this shower. It looks beautiful but I can't figure out how to get all nine shower sprays. I pressed each button but don't see anything with a massage. Thanks for your help. How does the hand shower mount swivel? We have just installed ours, and we cannot get the holder to adjust from the straight &quot;up/down&quot; position. With only 3 option buttons on the outer side of the handle, how do you activate the other 6 functions? Also, I struggle with getting the &quot;pause&quot; button to move. Do you press it from the inside or the outer side? Thank you. Is there any way to get more pressure through the shower head? Does this handheld include a non positive shut off. Cannot determine from spec sheet.